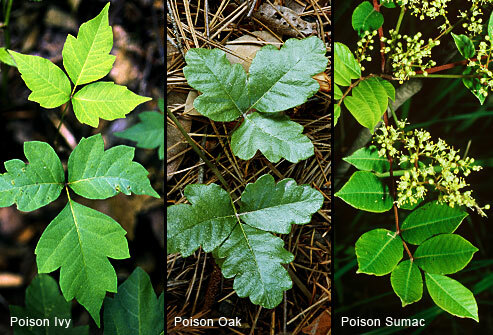 Poison ivy, poison sumac, poison oak: the three poisons we have to take care not to touch. The third doesn’t grow here, so we don’t need to worry about it. Somewhat rare in Northern Michigan, Poison sumac is a tall shrub that grows in wet places—I have seen it in the Platt River valley, locally. Ed Voss’s magnificent floral guide Michigan Flora shows a cluster of counties with the species: Benzie, Grand Traverse, Leelanau, and Antrim. It is much more common downstate. Poison sumac will not be confused with other sumacs, the staghorn sumac, for example. That plant has red berries and grows along fields and edges of hardwoods. As a teacher, I sometimes had to quell students’ fears that they would break out from touching staghorn sumac. Unlike that familiar shrub, poison sumac grows in places where you get your feet wet. If it has berries at all, they are white. 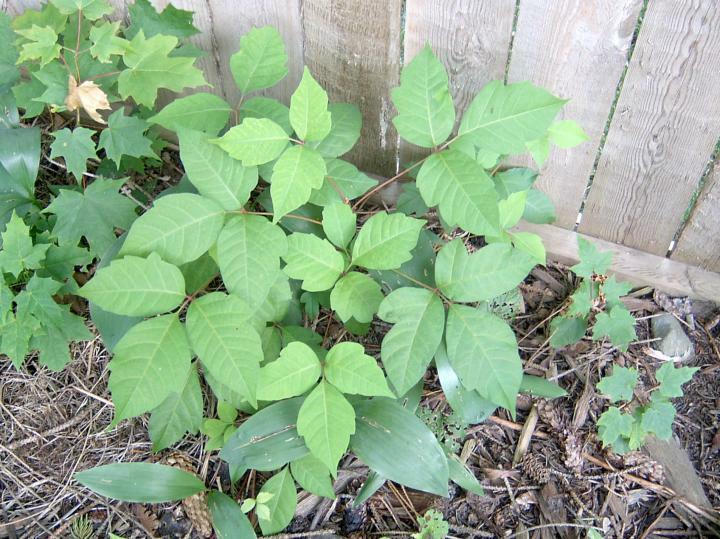 The leaves have the shiny look of poison ivy, but have 7-11 leaflets. Persons in search of pretty autumn color for their homes may be surprised to learn they brought it into the house. Poison sumac (Toxicodendron vernix) is closely related to an Asian plant (Toxicodendron vernicifluum) which is used to make lacquer in Japan and elsewhere in Asia. While serving in Japan, a dermatologist friend told me that patients came to him with a rash similar to that of poison ivy on the backs of their thighs. The cause turned out to be toilet seats covered with the offending lacquer. 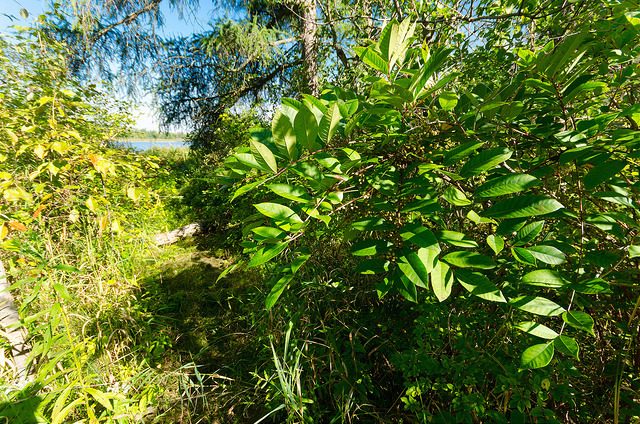 Poison ivy grows in a variety of plant communities: sand dunes, banks, shores, and along roadsides and railroad tracks. In the north, it does not climb trees, but remains as a small shrub, scarcely growing taller than two feet. Its shiny green leaves are, indeed, in threes (“leaves of three, let them be”), but that characteristic is not at all helpful since strawberry leaves come in threes, too. In contrast to the shrub form, it frequently takes on the growth habit of a vine in Southern Michigan, climbing a variety of trees, often to great height. Manistee county, according to Voss, is the farthest north this variety is to be found. Are two such radically different varieties—one a shrub and the other a vine—really the same species? In most characteristics—leaf position and shape, length of leaf stems, inflorescence (arrangement of flowers on the stem), number of flowers, fruit size—they are similar, but not identical. 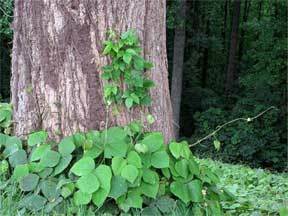 The vine form has aerial rootlets to cling onto tree trunks, while the shrub form has none. If they are the same species, they should form intermediate forms upon crossing the two. Have they been crossed to see what the offspring look like? Unfortunately, my source—William T. Gillis’s article in the Michigan Botanist, Vol. 1, 1962—talks only about one failed attempt. An early frost killed the buds on the growing hybrids. Gillis did attempt to bring the northern rydbergii form to southern Michigan to see if they would begin to take on southern characteristics. They did not. 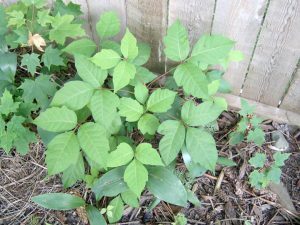 Let us leave the subject to say that poison ivy is a highly variable plant. One characteristic that all forms have is that they possess urushiol, the offending substance that causes the skin reaction in some persons. It is not volatile, so you cannot get the rash from merely standing close to plants: you must break the resin canals in the leaves in order to be exposed. Once exposed, it may take one or two days to react, or—in some cases—only a few hours, depending on the sensitivity of the person afflicted. Dogs and cats can carry the allergen on their fur, and smoke from burning leaves can cause serious trouble. It can even be carried on water—at least in the case of poison sumac, the species that loves to grow with roots in the water. 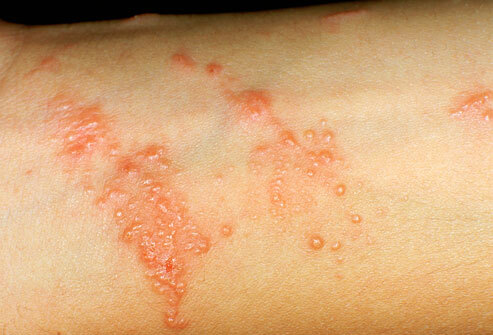 Rash caused by contact with Poison ivy, image courtesy of WebMD, CC-BY-NA. Not everyone is sensitive. Some persons can handle leaves and fruit with impunity. However, you cannot always count on previous insensitivity to avoid the rash. Sensitivity can change over time, and in either direction. Steroidal creams and lotions ease the suffering of those afflicted, and the itching and angry blisters will disappear over time. Still, a person will not want to suffer this assault every year. So much the better to learn these plants and avoid them. Have you ever noticed the “twin” brick residences on the corner of Division and W. 7th St. and wondered about their history? It’s obvious that they are constructed of Markham bricks, the same material as the Northern Michigan Asylum (later known as the Traverse City State Hospital). With their proximity to that building, it makes sense that there might be a connection. Brick house at 704 Seventh Street, on the northwest corner of Division and Seventh Streets. Image courtesy of Amy Barritt, April 2017. 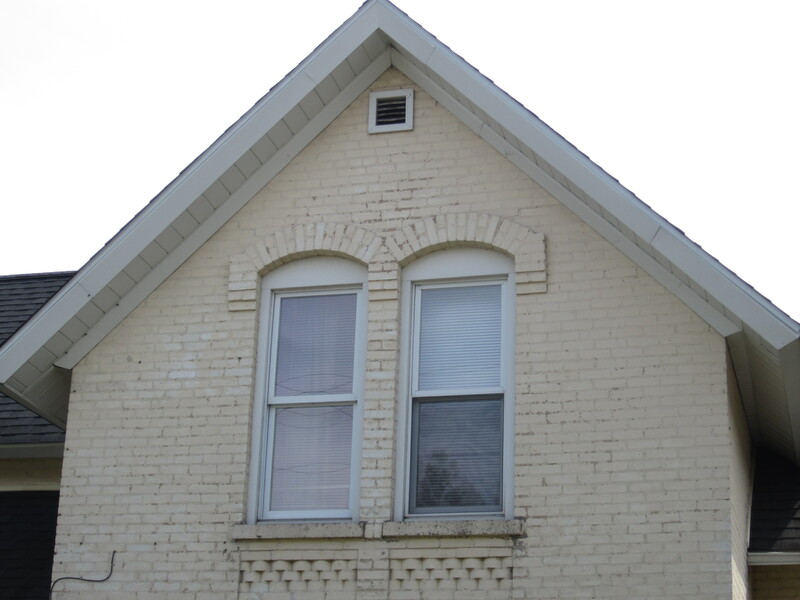 One story told about the origin of these houses goes something like this: During the earliest years of construction, there was a tramway built to haul the millions of bricks from the Markham brick yard north of Greilickville to the Asylum construction site. The tale continued that the tramway ran down Division, then made a sharp turn to the right down 7th Street, finally reaching the Asylum. At the point the tram veered, it was said, bricks often fell off the flat cars on the curve, but, since they were not to be used at the Asylum, simply remained there. 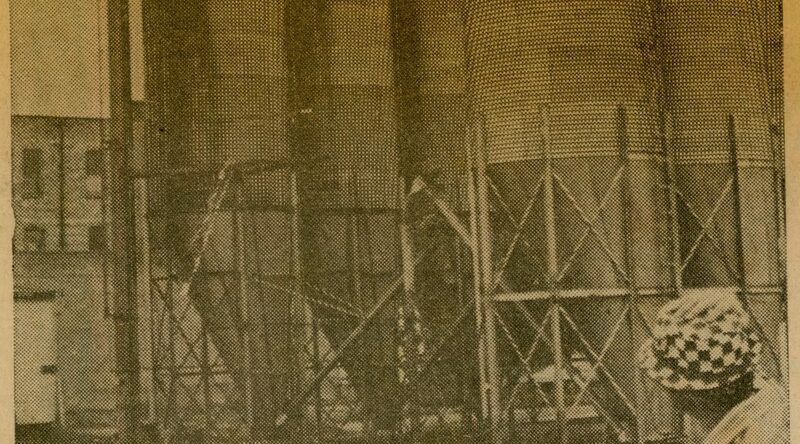 The “Markham brothers” later built their twin houses on the site using those dumped bricks. 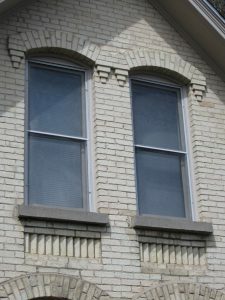 Detail on window of brick house at northwest corner of Division and Seventh Streets. Image courtesy of Amy Barritt, April 2017. After hearing this tale, some fact-checking was needed. 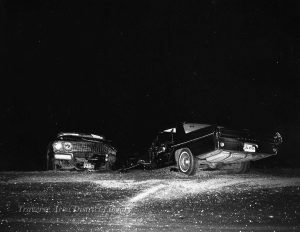 City directories, census records and newspaper articles were searched, and it was confirmed that there were no Markham “brothers” in Traverse City. James Markham, the owner of the brick-making business, lived near the brickyard west of town. Though very little is written about the tramway, it highly unlikely that it traveled down Division St. as that route would have been out of the way. Besides, the old Boardman millpond still covered the land where Division St. would later be, that pond existing as late as 1883. No documentation has been found that describes the actual route of the mule-powered track, but a route following the flat land along the Bay, then turning south down Elmwood St. to the construction site is more direct, and seems more likely than the supposed Division Street pathway. Detail on window of brick house at 703 Seventh Street, on the southwest corner of Division and Seventh Streets. Image courtesy of Amy Barritt, April 2017. 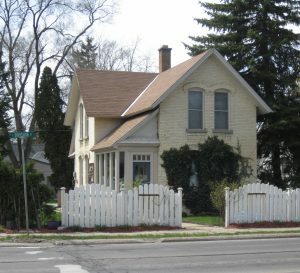 The 7th Street houses do have a connection to the Asylum. They were constructed by two men who were master brick masons employed at the Asylum as early as 1884, John Bilsky and John Sivek, both Polish/German immigrants. The common denominator in this story seems to be a man named Christian H. Petersen. Petersen was a master brick mason who, in 1880 was living in Milwaukee, Wisconsin. 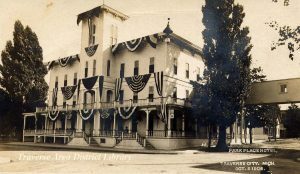 When the Northern Michigan Asylum was being planned, a call went out in the region for skilled masons and in 1884, he moved his family to Traverse City and went to work. The 1884 village directory shows C.H. Petersen head of a boarding house for masons and carpenters. Among the men listed in this residence is mason John Bilsky, who also had resided in Milwaukee. It can be assumed that John Sivek came from there as well (the pages with the names starting with S are not yet transcribed). His obituary states that he too, lived in Milwaukee prior to coming to Traverse City, where he was employed at the Asylum. These three men likely knew each other in Milwaukee and all took the opportunity for long-term employment. Brick house at 703 Seventh Street, on the southwest corner of Division and Seventh Streets. Image courtesy of Amy Barritt, April 2017. Bilsky and Sivek must have been good friends. 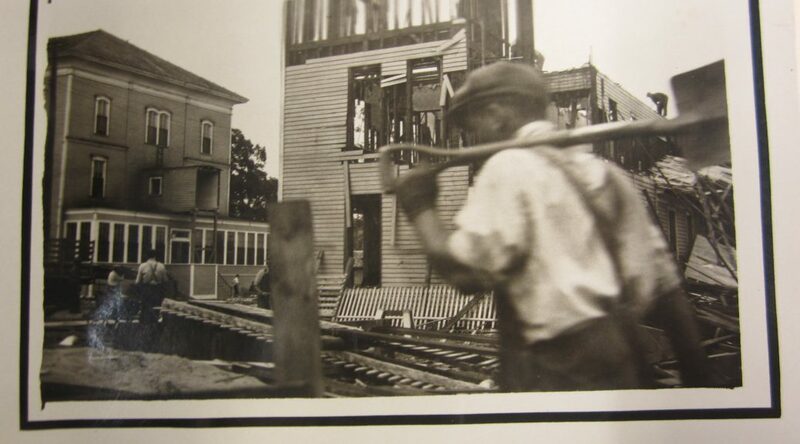 Each had immigrated in the early 1880s, and their common heritage, language and skills as masons tied them together. They were in the local mason’s union as early as 1900, when, that year, they refused to walk in the muddy street during a Labor Day parade and were fined by the labor union for not participating. 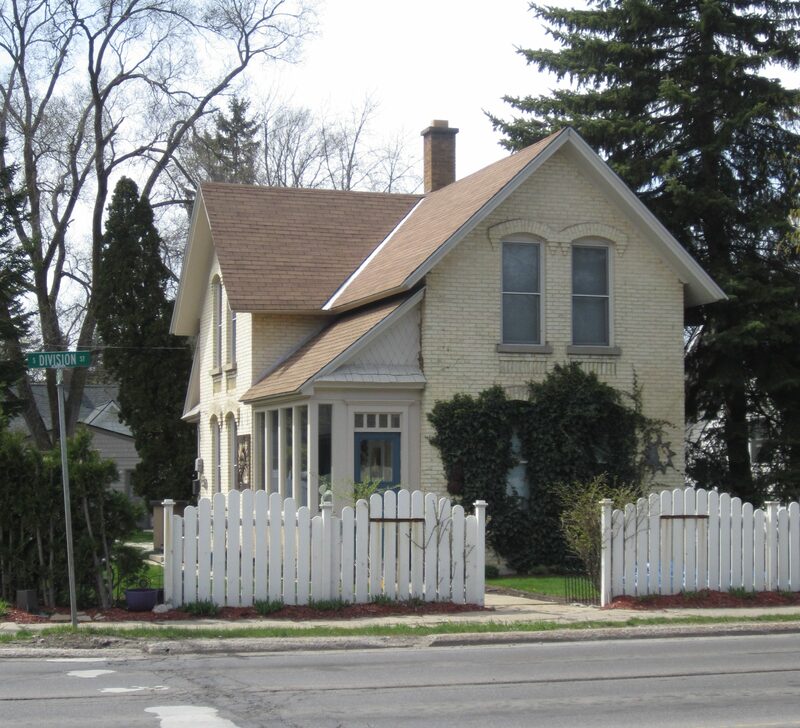 Their twin houses were constructed some time between 1889 and1894, the reasoning being that Christian Petersen’s 1889 Elmwood Avenue residence (309 S. Elmwood) was said to be the first brick home in the city: the two homes must have been built after that. The 1894 City Directory shows Bilsky & Sivek at 703 and 704 Seventh St., with subsequent sources such as the 1900–1930 census records and directories showing these men living at those locations. Both had sons who took possession of their respective family homes after their fathers passed away. John Sivek died in 1932, his son Thomas, also a brick mason, remaining at 703 W. 7th until his death in 1966. John Bilsky’s son John Jr., another second generation brick mason, lived in his house at 704 W. 7th until he died in 1956. The real story of the twin houses isn’t as entertaining as the “Markham brothers” tale but these lovely brick homes still standing after 125 years is testament to the brick-laying skills of these two men. Julie Schopieray is a regular contributor to Grand Traverse Journal. 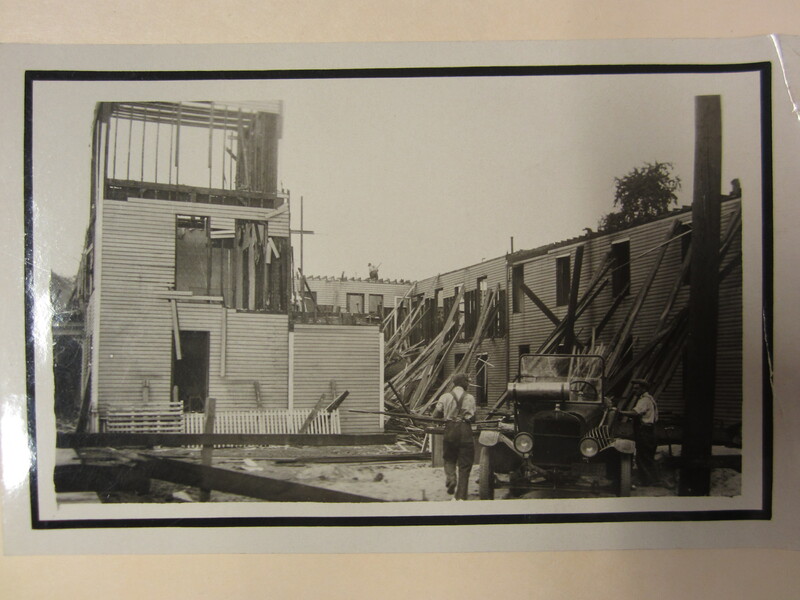 She is currently working on a biography and architectural history of Jens C. Petersen, once a Traverse City-based architect, who made his mark on many cities in Northern Michigan and California. Silos on Front Street in Traverse City, Michigan. 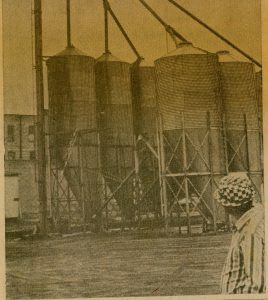 This image, published by the Traverse City Record-Eagle in December 1971 and taken by photographer John Hawkins, shows a pretty bizarre sight: Feed silos on Front Street? Do you remember where they were? Bonus points if you remember the name of the store or company they belonged to, or what was in them! Congratulations to reader Larry, who got in the first correct answer! 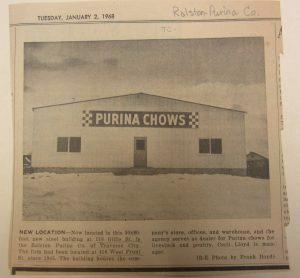 : “‘Ralston Purina Company’, 416 W. Front street, immediately east of today’s ‘Folgarelli’s’.” Good memory, Larry! We’d have to agree, Gary! Thanks to all our readers for reading and contributing. Each memory preserved in the Journal is another memory not likely to be forgotten! How does this Auto Accident relate to Michigan Bell? 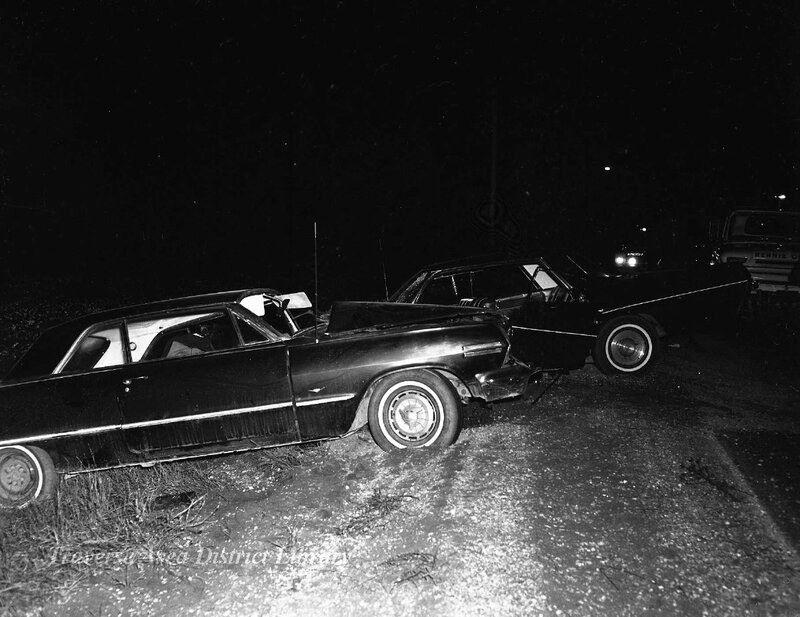 These images of an automobile accident in Mayfield were taken by newspaperman Al Barnes. 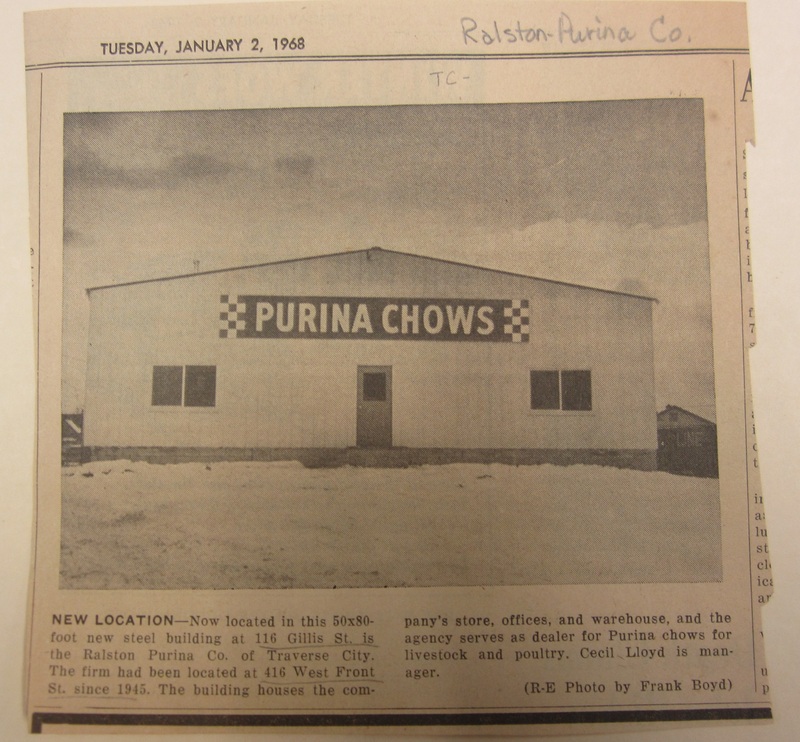 Recently, a reader of Grand Traverse Journal stumbled across these images while looking at our digital images collection (which you can look at here), and remembered something interesting, linking Michigan Bell Telephone to the scene. 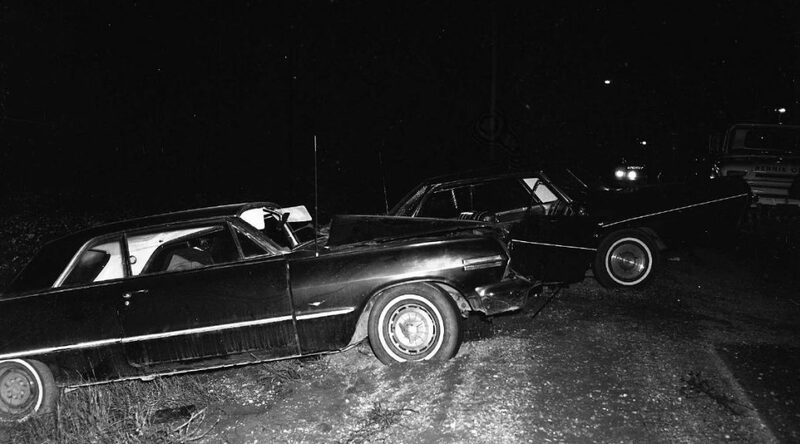 Here’s a hint: this accident took place in 1964! 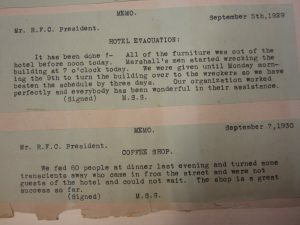 Recently uncovered in our local history files here at Traverse Area District Library were three photographs and a handful of typed memos, that tell the story of the end of the Campbell House. 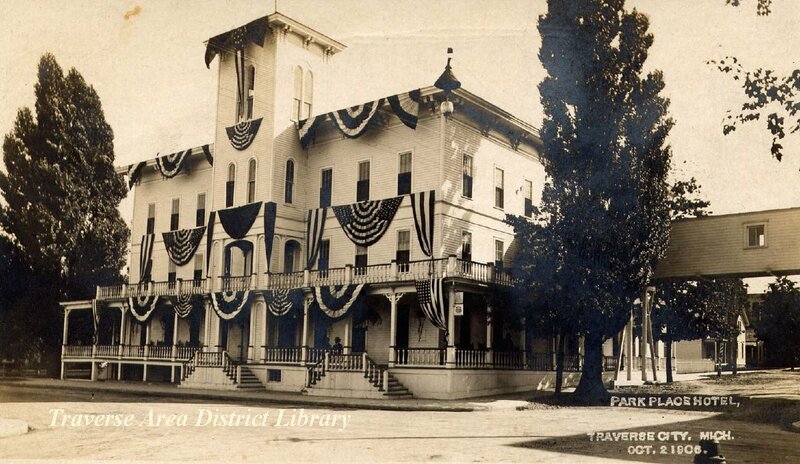 You may know it better as the Park Place Hotel, the name Perry Hannah and A. Tracy Lay graced the building with after they purchased the property in 1878. 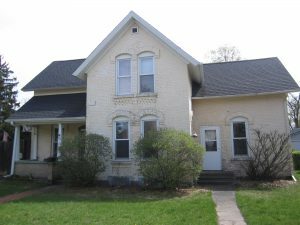 The Campbell House was announced as open for business in the Grand Traverse Herald on November 20, 1873, by proprietor Henry D. Campbell. The imposing three-story wooden structure dwarfed most of the surrounding buildings. You might be surprised to hear that the House sat at the southeast corner of State and Park Streets, “fronting State Street on the north and Park Place on the west,” 80 feet by 82 feet respectively. How is that possible? Before the Park Place was built at its current location, Park Street (or Park Place, the names were used interchangeably) extended through to Washington Street. 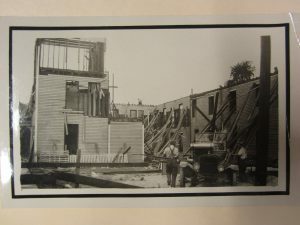 The all-wooden structure “succeeded to progress of the age,” according to the Traverse City Record-Eagle, who reported on the the demise of the original building on September 6, 1929. 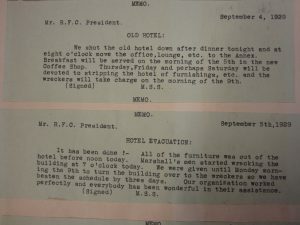 By the memos found, we know that the Hotel staff, including a moving gang of 20 men, were able to remove all the furniture before noon on September 5th, beating the scheduled evacuation date of September 9th by three days. 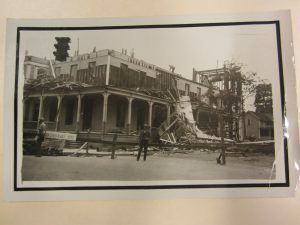 The wrecking crew wasted no time, and began demolition the same day (right about 7 p.m.) that the building was evacuated. The Park Place Hotel as we know it, with its 1930s Art Deco construction, was finished and open for business in June 1930. In the meantime, business continued as usual for the staff. How was that possible? There was no building, right? Few probably remember The Annex, which was located basically where the Park Place’s covered parking structure is today, and served as the “offsite location” of the Park Place Hotel. 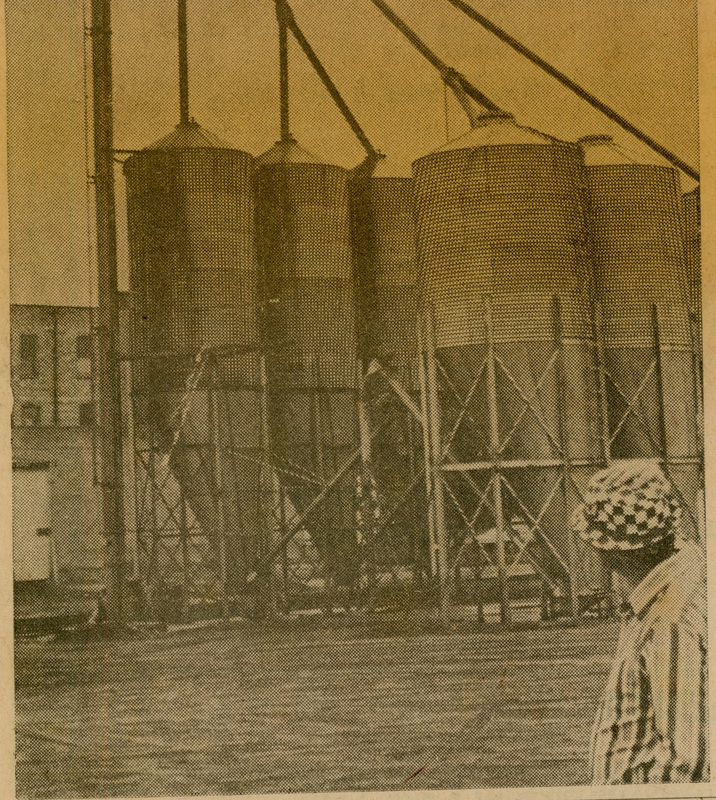 The Hannah & Lay Company originally constructed the Annex when business outgrew the original structure. 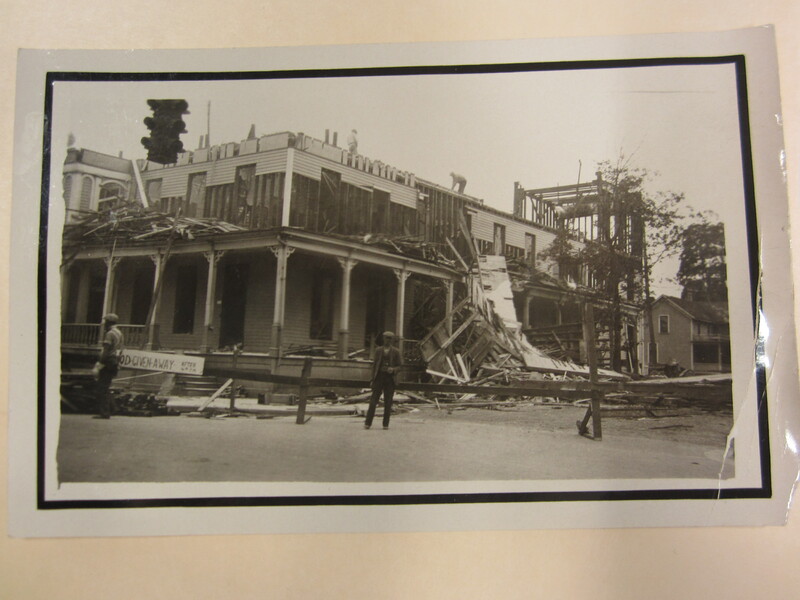 When the portion of the building that was the Campbell House still stood, the two buildings were linked by an overhead, covered walkway that extended across Park Street. 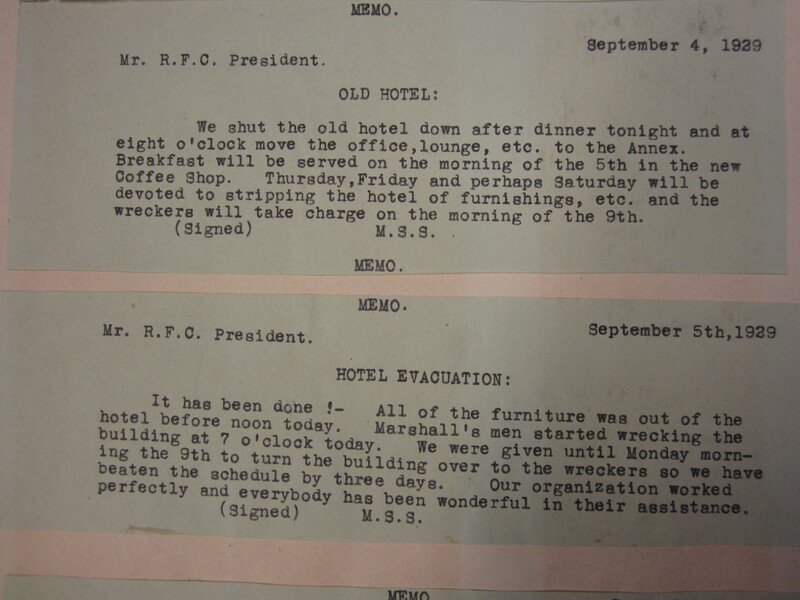 It operated as a complete hotel for guests, and was lightly remodeled to create additional space for an office, lounge, and a coffee shop and grill. The Annex Coffee Shop was such a success that the Park Place continued to operate at that location for another year, even after the new Park Place Hotel building was finished. As the Park Place itself described the Annex, it was “very convenient for Luncheon when downtown or an afternoon game is on… Or perhaps Sunday dinner when you are dressed up and look so nice.” Classy! Amy Barritt is co-editor of Grand Traverse Journal, and special collections librarian at Traverse Area District Library. Thanks go to Marlas Hanson for re-discovering these gems on the Campbell House! 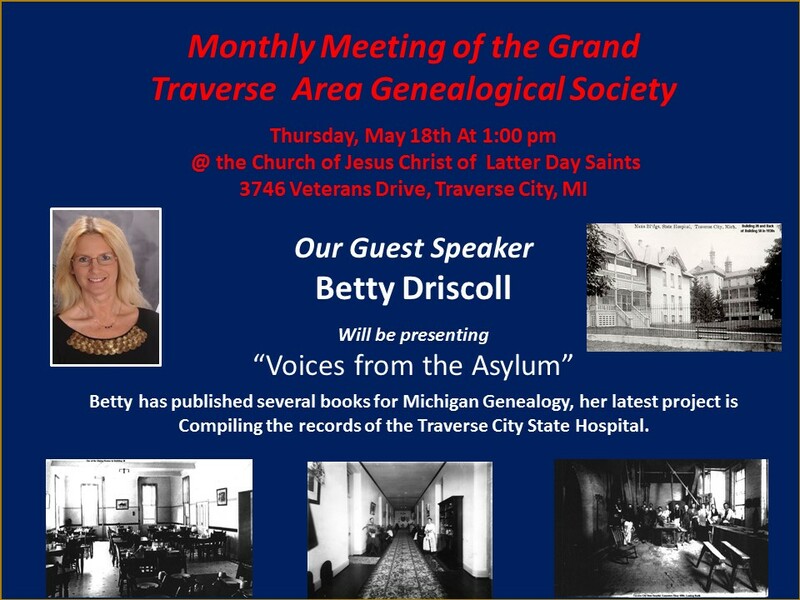 The May Meeting will be held Thursday May 18th at 1:00pm at the Church of Jesus Christ of Latter Day Saints, 3746 Veterans Drive, Traverse City. 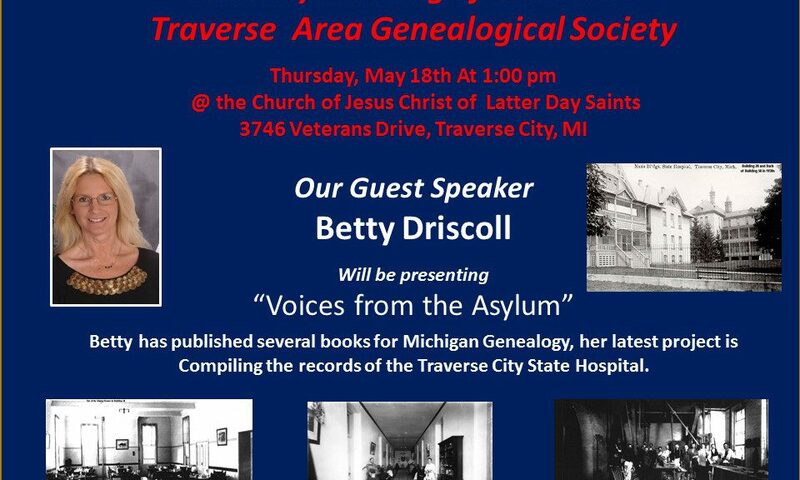 The guest speaker is Betty Driscoll, who will be speaking on “Voices from the asylum.” Her current project is compiling the records from the Traverse City State Hospital. The event is free of charge, and open to the public, no reservations are required. TAHS has one more spring program to be presented on Sunday, May 21st in the McGuire Room at the Traverse Area District Library. It will start at 1:00 p.m., with light refreshments being served following the program. May 21st: “Les Biederman and the History of Radio in Traverse City,” given by local historian Maddie Lundy! 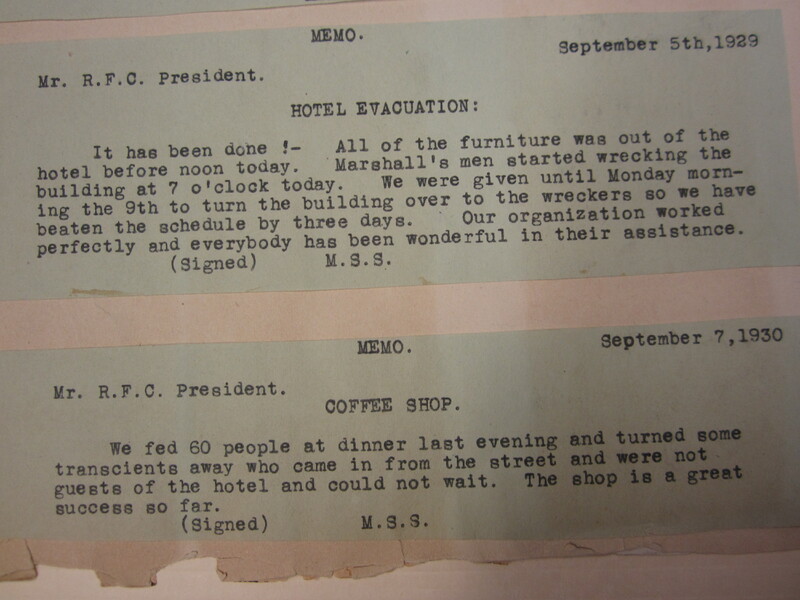 Also, check out our latest newsletter for a letter from the President, an update on the Archives, and a sneak peek of our Summer Tour line-up! 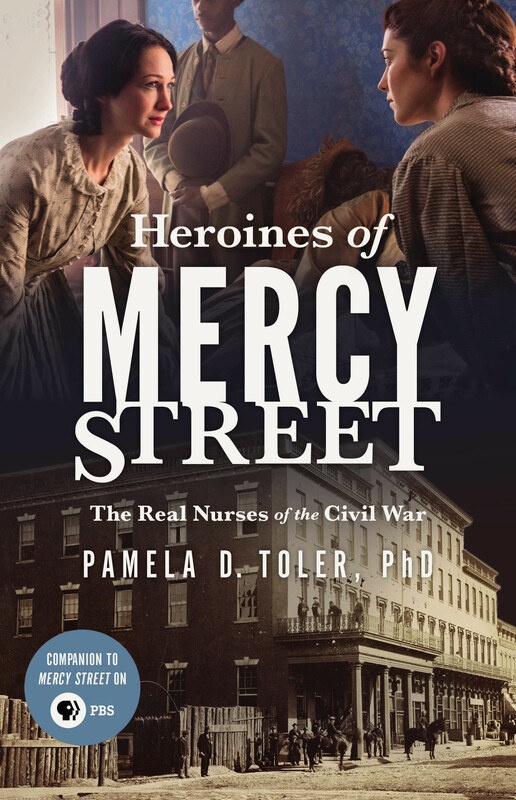 Pam Toler will address the Benzie Area Historical Museum on Thursday, May 11th at 7PM at Mills Community House, on the lives of women Civil War Nurses. Toler is the author of Heroines of Mercy Street: The Real Nurses of the Civil War, written to accompany the PBS series of the same name. Event is free and open to the public, and co-sponsored by the Benzie Women’s History Project.